Policy-screening scenarios are used in ex-ante assessments to forecast the effects of alternative policy or management options (interventions) on environmental outcomes. 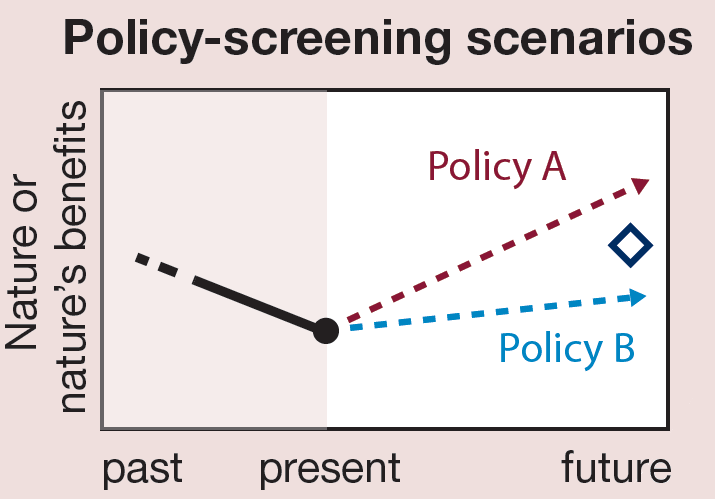 In policy-screening scenarios, a policy, or set of policies, is applied and an assessment of how the policy modifies the future is carried out (Figure SPM 2). Policy-screening scenario analysis can contribute significantly to policy design and implementation. Figure SPM 2: Policy-screening scenarios illustrated by a graph of changes in nature and nature’s benefits over time. The dashed lines represent various policy options under consideration. Table 3.1: Combining scenario approaches and policy objectives (in the context of policy-screening scenarios ). Strategic Environmental Assessment of Hydropower on the Mekong mainstream (SEA Directive, 2001).